Club Penguin Cheats by Mimo777 Club Penguin Cheats by Mimo777: I STILL think there will be NO Card Jitsu Snow this year! I STILL think there will be NO Card Jitsu Snow this year! At this time of year for the past 3 years Club Penguin has hinted and eventually rolled out a new Card-Jitsu. In 2008 Club Penguin had secret Ninjas showing up around the island. Sensei appeared for the first time then announced the original Card-Jitsu. 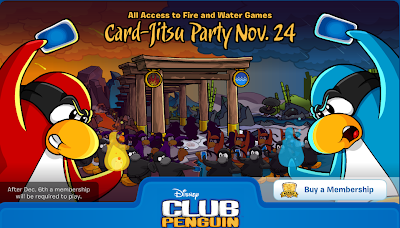 In 2009 Club Penguin Card-Jitsu Fire was announced. Club Penguin hinted at this announcement with sneak peaks and Billybob emailed MIMO with a secret video. In 2010 The storm clouds appeared over Club Penguin's Dojo. Billybob emailed MIMO again with another sneak peak video about Card-Jitsu Water. Then Club Penguin launched Card-Jitsu Water. This year? Nothing. Billybob has not emailed me anything. No hints. No sneak peeks. IT'S NOT HAPPENING yet! Get over it. This screen appeared announcing a Card-Jitsu Party. A FIRE and WATER party for non members! Then Sensei said this in the newspaper this week. Card Jitsu Snow? "IT WAS NOT YET TIME." That does not mean NEVER, it means NOT YET! maybe in january there will be an avalanche! I agree with Mimo. All signs point to no Snow. Seriously, don't you know CP? They say "nothing will happen", and too weeks later... BOOM!!! But if you look closer you can see shadows of ninjas and beneath them a sign of snow. If you recive an email from bilybob few years ago...Why did you dont't ask him about card jitsu snow? there must be no sign right now, but there might be hints in the party. can you email billybob and find out? i almost aggre but it said: be patient-the elements will reveal when the time is right." i think it will be soon (because 2012 is near)and in the party it may be "card-jitsu snow" party right? i want you to notice that in the gate way in that log in screen there is two ninjas with Sensei. the ninjas dont look like they are wearing the known ninja gear. I think there will be a battle specail room for the party but not the snow dojo, i deffinetly agree with mimo777 it will propably start in janaury like every1 else said! My brother is going to be bummed out when I tell him. Hes been waiting since like 2009! Hopefully next year or he'll probably quit! I hope it rains and sky turns orange at the card jitsu party, i love all this weather!! No, at least, not this year. I sent an email to Club Penguin... so hopefully they'll reply. The only clue I can find is that in the space where the fire and water dojos are... there's a snow-capped mountain. And there's a place on the amulet for card jitsu snow. And card jitsu shadow. (the rock in the middle) So it's obviously coming... just maybe not this year. Hey guys! Listen to this. Until Dec. 6 CJ F and W are open to all. I think Dec .10 approx. CJ Snow. Also, the staff themselves, like always, didn't give me a straight answer as to why to are REALLY delaying the release. That junk about "the elements aren't ready" is just common crowd waffle. I'm gonna take a closer look at my e mail, see if I can find a subtle clue. i think just like everyone else, during the party there will be clues to card jistu snow, just keep an eye out when the party starts, maybe mimos right and maybe hes wrong. I agree Mimo. Perhaps we'll have to wait until next year? I agree. That sounds like a possibility, although Billybob has given away any clues if this could happen. Mimo, after intense investigating with my friends, we have found some clues to CJS (Card Jitsu Snow). Next to the Sensei, there are two blacked out penguins. Possibly, CP blacked them out because they're the Snow Ninja costume? And under where the Sensei is standing, there is a white floor. Possibly the CJS element symbol? Also, there are ninja shadows around the Town and inside a couple of shops too. There have always been ninjas before a new CJ game was released. I know this one - its snow. When does it snow? December, January, or February. But this year - apparently October. 2.theres a card jitsu board game and when you open it theres card jitsu fire in one corner, card jitsu water then snow at the bottom. Animated shorts on the disney channel and much, much, much more! Can u not see! in the gateway thing on the login screen there is sensei and two other ninjas in black, they blacked them out because of maybe the snow suits! and their standing on top of a while amulet! something is up, but i know we wont have to wait another year for snow. It is great to hear from you today! I understand you have some questions about the still-mythical Card-Jitsu Snow. You are right - Sensei has said it is not yet time for Card-Jitsu snow, but the elements will reveal when the time is right! Sensei is a pretty wise guy and master of Card-Jitsu so he will all let us know when the time is right. In the meantime, I suggest you start training for the Card-Jitsu Party coming to Club Penguin on November 24 - ninjas must be prepared for everything! If you have any further questions, feel free to send us another email as we are always here to help. Please only put CPGZ Mod after your name only if you are modding are already are a mod. Ok, last time I said it would be in December, Januray, or Feburary. Well, I believe I am right. I HAVE ONE HUGE CLUE!!!! My brother was walking around Target and he SPOTTED a tin for Card Jitsu Snow!!!! I saw it and it actually had the costume of the snow ninja. So, this means it's soon! The only thing I don't understand is that it came out out In September. IT'S STILL THERE! And most likely, it will show itself in Janurray for the expedition party. Hes right!~ I went to Target and the Snow Jistu Tin is out now! maybe card jistu snow is going to come sooner then we thought, last year the water jistu tin came out early, and just a few days later, water came! it might be the same with snow!